Last edited by The odd man on Sat Sep 03, 2011 2:29 pm, edited 1 time in total. For me, i'd say mostly Chaotic Good. This thread is useless, I say we close it. That doesn't necessarily means we want you to make it, since we're just guessing whether you want to make it or not. And our randomness prevents anything to be organized so let's just rename the topic, or delete it. I'm currently a Lawful Evil person. Even I am supposed to be Chaotic Evil now but it'll be a good start. But lately I did everything that could be related with a Chaotic Evil person. That was easy to notice since i read most of the topics you guys post on. 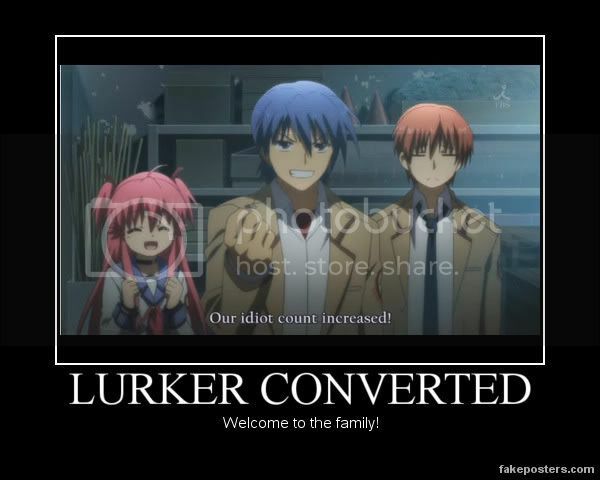 <---- Was lurking since 2010. Surprised that you didn't make an account back there. Just list all alignments that you could switch to. Diseases and some other factors forced me to switch to Kahlua (A Lawful Good person). interesting?...so now your the you you were before recently? Mental maelstrom boiling down. Reaper's keepin' an eye on whats formin', and the most prominent feeling is of femininity. Alt 20 is forming as you read this. Heh. Surely it's Lester's second female alt. As for me, they're all females. Was it another deja-vu of mine? Anyway, the board always go berserk. Is this just me or the Caesar is a catgirl? Anyway, surely we'll have more fun. A full-body palpation might heal you up.